I know some people always busy especially businessman, a lot's of meetings, phone callings, emails. Sometimes their life look so mess that cause too many thing need to do, and they do not have time to organize them. If you are a this kind person maybe you can try Ikordo, that is an intelligent free service and helps you to organize your business meetings. After you registered you can make a meeting schedule with Ikordo, just simple enter a time period of when you need the meeting to be scheduled. After that, Ikordo will email everyone on your behalf and will start to ask about their availability. It will keep working until the perfect meeting time is confirmed. 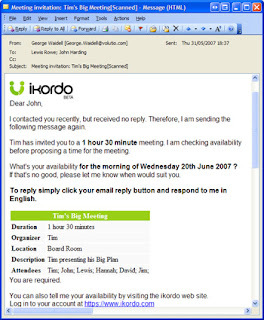 When everything is all done Ikordo will send a confirmation email to everyone, it also will remind everyone about the meeting time. 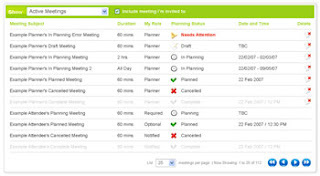 So Ikordo will organize your meeting schedule for you.